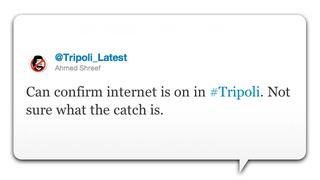 Ever since rebels more or less seized control of Tripoli this weekend, there's been something else on the verge of liberation besides the embattled city' residents: their internet. And early Sunday morning, the Twitterstream suddenly began reporting something that seemed, on the face of it, totally improbable: the Internet had been turned back on. Why would the government turn the Internet back on in the middle of an armed uprising? To get people to stay at home and catch up on five months of email? It seemed preposterous. But clearly, as more and more people realized, it had happened. Bandwidth was scarce, but DSL service was back. People started Skypeing with friends and relatives, some reporting hearing live gunfire in the background as their VoIP calls began to connect.